Day 99 of the #365drawingchallenge continues Hellboy Week with BPRD member Liz Sherman. Elizabeth Sherman is a pretty big part of the comics and the first two Hellboy movies, and is a pretty cool character. She has fire powers but struggles to control them. She has a dark past where her powers caused her to kill accidentally and still suffers from identity issues. 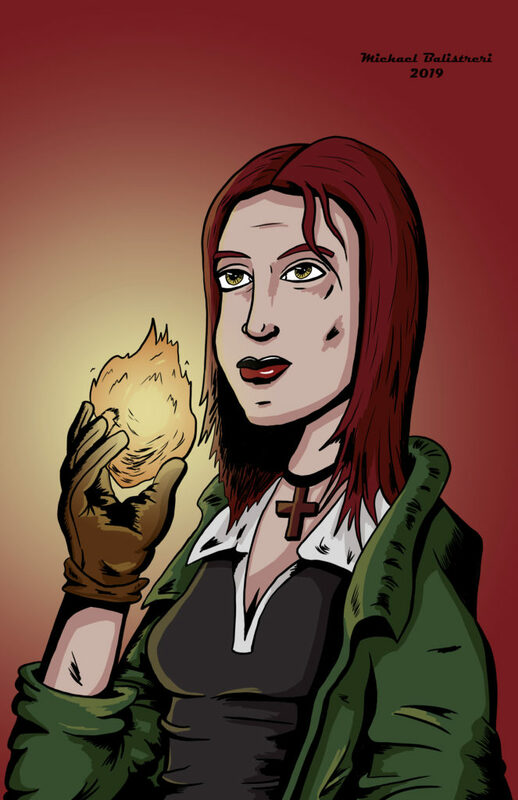 She’s also a very central figure in the Hellboy spinoff BPRD series. I’ve seen her portrayed pretty differently by various artists, so it was fun to come up with my own look. I sort of combined a few of her different iconic looks here, and I like the way it came up. Drawing women is a bit harder for me, but it felt a little easier this time. I think all this drawing has helped me build up some skills along with confidence, so I have more of a tool set to know where to start when drawing something like this.